, a celebrated English judge, descended of an ancient family, was the eldest son of Thomas Westcote, of the county of Devon, esq. 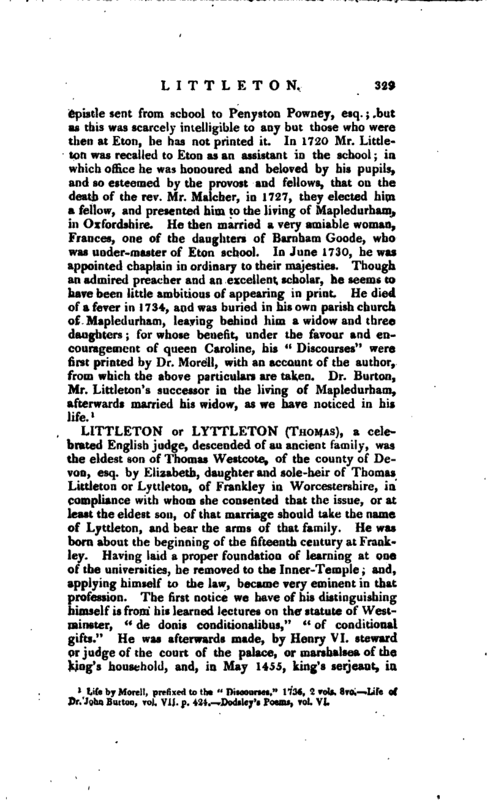 by Elizabeth, daughter and sole-heir of Thomas Littleton or Lyttleton, of Frankley in Worcestershire, in compliance with whom she consented that the issue, or at least the eldest son, of that marriage should take the name of Lyttleton, and bear the arms of that family. He was born about the beginning of the fifteenth century at Frankley. Having laid a proper foundation of learning at one of the universities, he removed to the Inner-Temple; and, applying himself to the law, became very eminent in that profession. The first notice we have of his distinguishing himself is from his learned lectures on the statute of Westminster, “de donis conditionalibus,” “of conditional gifts.” He was afterwards made, by Henry VI. steward or judge of the court of the palace, or marshalsea of the king’s household, and, in May 1455, king’s serjeant, in | which capacity he went the Northern circuit as a judge of the assize. Upon the revolution of the crown, from the house of Lancaster to that of York) in the time of Edward IV. our judge, who was now made sheriff of Worcestershire, received a pardon from that prince; was continued in his post of king’s serjeant, and also in that of justice of assi/r for the same circuit. This pardon passed in 1462, the second year of Edward IV. ; and, in 1466, he was appointed one of the judges of the court of Common Pleas. The same year, he obtained a writ to the commissioners of the customs of London, Bristol, and Kingston-upon-Hull, enjoining them to pay him a hundred and ten marks annually, for the better support of his dignity; a hundred and six shillings and eleven pence farthing, to furnish him whh a furred robe; and six shillings and six-pence more, for another robe called Li num. In 1473, we find him residing near St. Sepulchre’s church, London, in a capital mansion, the property of the abbot of Leicester, which he held on lease at the yearly rent of 1 <'>.-. In 1475 he was created, among others, knight of the Hath, to grace the solemnity of conferring that order upon the king’s eldest son, then prince of Wales, afterwards Edward V. He continued to enjoy the esteem of his sovereign and the nation, on account of his profound knowledge of the laws of England, till his death, Aug. 23, 1481, the day after the date of his will. He was then said to be of a good old age, but its precise length has not been ascertained. He was honourably interred in the cathedral church of Worcester, where a marble tomb, with his statue, was erected to his memory; his picture was also placed in the church of Frankley; and another in that of Hides-Owen, where his descendants purchased a good estate. He married, and had three sons, William, Richard, and Thomas. Kichard, bred to the law, became eminent in thut profession; and it was for his use that our judge drew up his celebrated treatise on tenures or titles, which will probably hand his name down to the latest posterity. 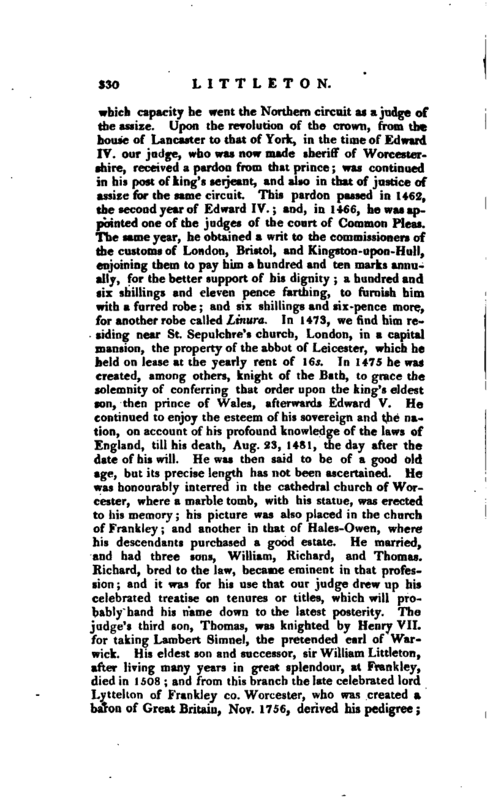 The judge’s third son, Thomas, was knighted by Henry VII. for taking Lambert Simnel, the pretended earl of Warwick. His eldest son and successor, sir William Littleton, after living many years in great splendour, at Frankley, died in 1508; and from this branch the late celebrated lord Lyttelton of Frankley co. Worcester, who was created a baron of Great Britain, Nov. 1756, derived his pedigree; | but who, owing to the alteration in the spelling of the name (which, however, appears unnecessary) will occur in a future part of this work. Biog. Brit.^-Dibdin’s Typographical Antiquities. 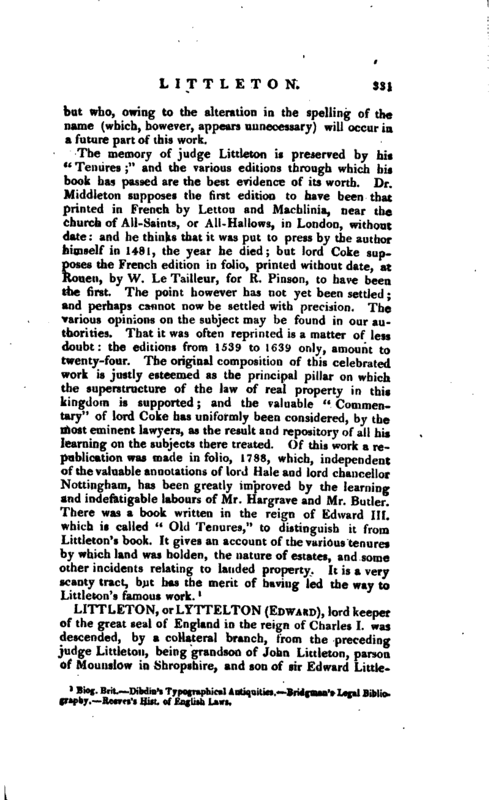 Bridgmau’s Legal Bibliography. Reeves’s Hist, of English Laws.